RIVERHEAD FOUNDATION COURTESY PHOTO | Roxanne, a Risso’s dolphin was released Wednesday morning. Roxanne, the 700-pound Risso’s dolphin found marooned on a Jones Beach Island sandbar, is swimming freely once again after being released Wednesday by her caretakers from the Riverhead Foundation for Marine Research. Riverhead Foundation officials were seeking help raising funds needed for her release from rehabilitation. In all, about $35,000 was needed to completely fund her rehabilitation and release, according to a foundation spokeswoman. 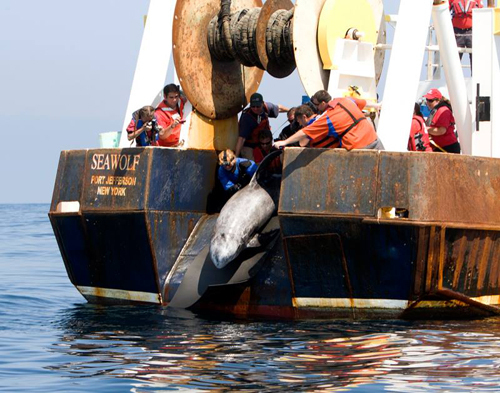 The 9-foot dolphin was transported by truck to the Shinnecock Commercial Dock in Hampton Bays about 8:30 a.m., where she was loaded onto Stony Brook University’s boat, Sea Wolf. The Sea Wolf took her 20 miles offshore, where she was released into ocean waters, according to a release. It took an 18-member team, a crane, a transport truck and the Sea Wolf to carry her back into the ocean, according to the non-profit’s officials. She was fitted with a satellite tracking device. Her travels can soon be tracked on the foundations webpage. RIVERHEAD FOUNDATION COURTESY PHOTO | Roxanne and foundation volunteers during a physical. A campaign to raise funds for the release of the Riverhead Foundation’s newest patient is making waves. Roxanne, an adult Risso’s dolphin was rescued just south of Oak Beach on Jones Beach Island in Babylon June 6. The U.S. Coast Guard found her struggling from dehydration and gastric bleeding on a sand bar, according to officials from the non-profit. 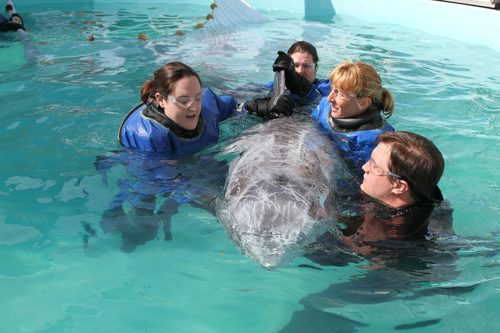 Foundation volunteers transported Roxanne on a stretcher, loading the 9-foot, 600-pound dolphin into the back of a vehicle and brought her to her current home in Riverhead. 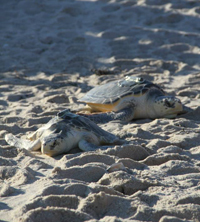 Roxanne will need an 18 member team, a crane, a transport truck and a vessel to carry her back into ocean waters. 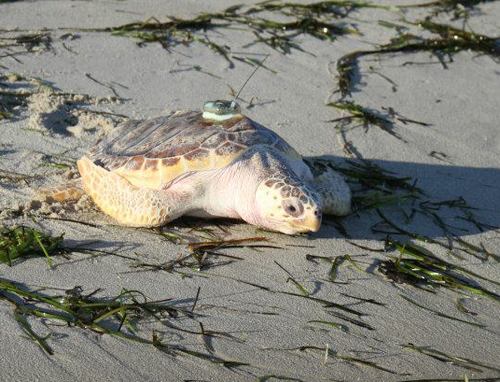 She will also be fitted with a satellite tracking device in order to provide data on how she behaves after her release. In all, about $35,000 is needed to completely fund her rehabilitation and release, according to a foundation spokeswoman. Her story aired last Thursday night on WABC’s Channel 7 Eyewitness News, generating more than $4,500 in donations in the 24 hours following the broadcast. The network included the hashtag #FreeRoxanne, which is now being used to spread Roxanne’s story on Facebook and Twitter. More information about Roxanne can be found on her donation page, and a real-time view of her can be seen on the foundation’s website. Foundation officials said they hope to release Roxanne in early September. RIVERHEAD FOUNDATION COURTESY PHOTO | Roxanne in her tank at the Riverhead Foundation.